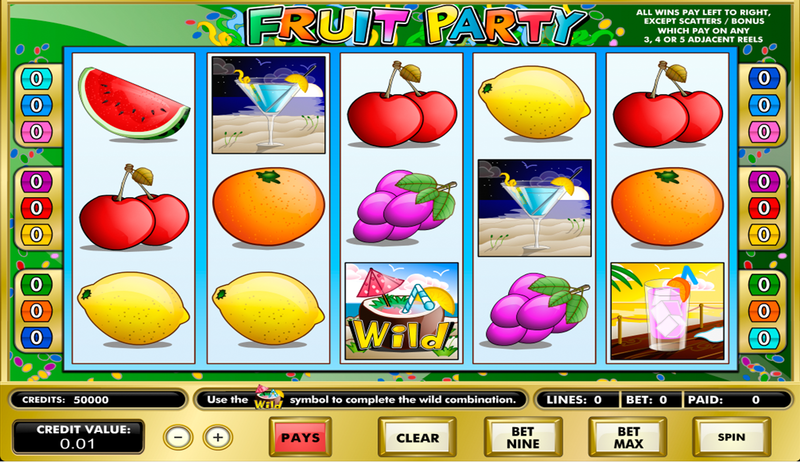 Fruit Party Slots was a slots machine that just had too many holes in it to really be something special. There were some very good things done on this machine but the bad things really overshadowed all that was done well. The first thing I noticed about this machine really brings this point home. The betting options were pretty good in some parts but really bad in others. The betting range was excellent and will make this, at least, a machine that is accessible to a wide variety of players. The reels could be spun for as little as a penny or for as much as 225 dollars. The bad though was that there were only nine pay lines included on this machine. While playing you definitely lost on way more spins than you won on which made the game much less exciting and I think this was due in large part to how few pay lines there were. The symbols also weren’t very well done in my opinion either. I just thought that a lot of the symbols looked to similar to one another and this led to a lot of brief periods of confusion while I was playing which slowed down the game play. The wild symbol was without a doubt the most disappointing feature included on this machine. I just don’t know what was going through the designers minds when they created this symbol. The symbol itself was a picture of a coconut drink and it appeared on every reel. My big problem with the symbol was the fact that it could only substitute for two symbols; the other two drink symbols. This really meant that the wild symbol very rarely led to the creation of winning symbols which is its sole purpose. And to make matters worse the designers made it so that the wild symbol appeared on the screen all the time only so that it could result in nothing, kind of like a tease. The best part of this machine was hands down the scatter symbols. This is because this was the one spot where players could really rack up the big prizes. There were two scatter symbols included but they essentially did the same thing. Each symbol looked almost identical to each other and the defining feature was that the word “scatter” was plastered in front of them. Both symbols appeared on every reel and was used to award a randomly selected prize whenever three or more of the same scatter symbol appeared on adjacent reels together. The reason why this was so great was because the prizes that it awarded were absolutely huge and in many cases they were much larger than what you were going to win in the bonus game. It also appeared much more often than the bonus game so it had a bigger impact.